You make big investments in training and developing your people, but what happens when the session is over? In the hustle of daily activities, it’s easy for your employees to fall back on old habits and behaviors. If you aren’t making learning “sticky” by linking it to new behaviors, you’re wasting time and money. We’ve developed a system that provides a new approach to how teams learn, as well as increases the level of knowledge transfer that happens after training. Our Conversations methodology and our Habit Builder products help teams understand and implement new ideas in the unique context of their work. Your big ideas. Our Habit Builder. What do your people need to know and do differently to achieve your business objectives? Whether you start with a kickoff, keynote or workshop—add our Habit Builder. It’s designed to help your teams commit to changes in their habits and behavior that align with the message they just heard, and your objectives. 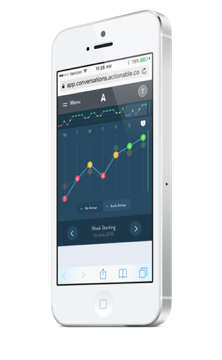 Actionable’s Habit Builder combines technology and behavior science to create powerful change in teams and organizations. Organizations can use data from the Habit Builder platform to understand where change is happening, if gaps exist, and how leaders are working with their teams to drive change. You can combine the Habit Builder with our Conversations methodology as well, which provides resources and frameworks for leaders to discuss new concepts with their teams. More than 7,000 people have used Actionable to make over 10,000 commitments to behavior change, with 92% of Actionable clients saying they’d use Actionable again. We're changing the Learning Equation. We know Learning ≠ Outcomes. Without behavior change, learning evaporates before it can help employees build the skills needed to meet critical business priorities. We understand how habit change works. We’ve applied the research from top behavioral scientists like BJ Fogg and Charles Duhigg to allow teams to build new skills based on the information they learn in training. Our process reinforces habit change over 30 days by reminding employees about the change they want to make, asking them to assess their progress, and giving them the option to enlist an accountability buddy to provide support. Actionable helps your team embrace the behaviors needed to achieve your business outcomes, and turns those new behaviors into lasting habits. Want to learn more about how building new habits can create significant change in your organization?